Last Friday, we put out our second ever code challenge. It was a good way to get a little coding practice in over the weekend with a concept that is fairly new, CSS Grid Layout. Before CSS Grid, we&apos;d have to focus on using floats, display: inline-block and all manner of moving elements around. Thanks to new properties like grid-template, grid-gap, and grid-column/grid-row, we can write this calculator in very few lines of code. 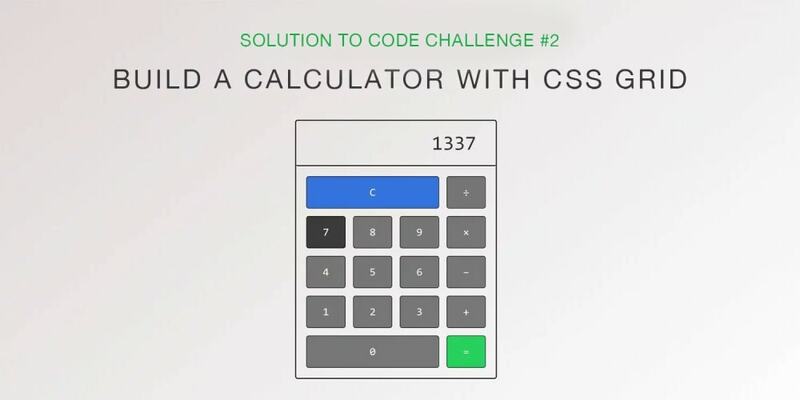 The challenge was to build this calculator using CSS Grid! I&apos;ll be working within a CodePen for this tutorial. I&apos;ve also made a video for those that like the video format. Notice I&apos;ve added some line-breaks/spacing for clarity. We have put line breaks where we visualize our grid rows will take place. Slowly but surely, we are moving along! We&apos;ll quickly style the buttons before we get onto the CSS Grid fun. We&apos;ll be adding CSS for the individual buttons but we won&apos;t deal with the .calculator-buttons container yet. That&apos;s where all the CSS Grid magic will happen. This will just be for quick styling. Now we have our input and buttons looking good! The last part of our calculator may just be the easiest part. We&apos;ll use the CSS Grid to position our buttons. To use CSS Grid Layout, we just have to define the layout we would like on our parent element; in this case, the .calculator-buttons div. Feel free to play around with these numbers, but we&apos;ll start by creating our four columns. We have declared display: grid to make sure this container is a grid. Next we define the four columns we want using the fr (fractional unit). This means that CSS will create the columns with equal widths. This means each of our four columns will be 25% width. We don&apos;t even have to define the number of rows here. The elements will keep moving to new rows until they are all placed. This is very helpful when you want to create many columns. Our buttons are sitting right next to each other, but we need to add some spacing to them to make it look like an actual calculator. Now our calculator buttons have spacing! For our larger C (clear) and 0 buttons, we can easily make them span across multiple columns by targeting them specifically. Let&apos;s target each individually because we also want to change their colors out. This could be done with one CSS class, if you wanted and it could be called span-3 or something along those lines. The last sprinkle of styling we&apos;ll add that gives this calculator that extra bit of pizazz is the font. Head on over to fonts.google.com and browse around for a good Monospace font you like. I&apos;ve settled on Space Mono for my calculator. I hope you enjoyed that quick lesson on CSS Grid and the Code Challenge. Let me know in the comments if you&apos;d like us to continue doing these Weekend Code Challenges and posting the solutions on Mondays. Happy coding!